‘The Pavilion’, Brookfield Manor is a new exclusive and unique venue, set in the village of Hathersage by the River Derwent, in the beautiful Derbyshire Dales and on the doorstep of the Peak District National Park. ‘The Pavilion’ is licensed for civil ceremonies and can host both large and small parties for prestigious weddings and other special occasions in luxury and comfort to suit your needs. The recently restored ‘Pavilion’ was built using the mellow peak district stone, ‘Millstone Grit’ and features a paved terrace with fine Doric columns supporting a classical portico. The modern but classically styled interior is a mix of off-white and ivory tones to create a perfect neutral background for any bridal and floral colour scheme. Large gilt mirrors and doors to the terrace provides light and brightness to create a heavenly atmosphere. It can seat 100 or more wedding guests for civil ceremonies. 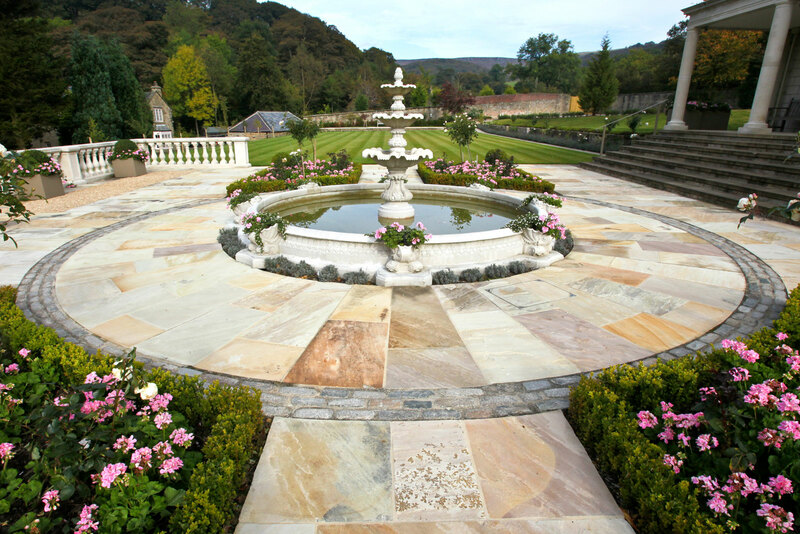 The large terrace and colonnaded portico leads to a few steps down to the central terrace and fountain with newly laid manicured marquee lawns stretching either side at the same level. Marquees on the lawns can comfortably accommodate up to 130 guests. Set in its own landscaping and surrounded by mature trees the Pavilion, lawns and terraces offer uninterrupted views of the surrounding countryside. There is a tarmac car park set to the rear of the Pavilion with can comfortably accomodate up to 45 cars. Adjacent to ‘The Pavilion’, a short walk through trees and over the red ‘Monet’ Giverny style bridge is the relaxed Brookfield Manor that dates back to 14th century. It was extended around 1825 when it was given a gothic façade and is now in the private ownership of your hosts, Sir Hugh and Lady Sykes. Interestingly Brookfield Manor was fictionalised as ‘Vale Hall’ in the book ‘Jane Eyre’ written by Charlotte Bronte and inspired by her visit in 1845. In the tree lined pathways around the Pavilion are hidden treasures that provide the perfect setting for photographs, with classical statuary and the elegant temple: an opportunity to capture a timeless reminder of a perfect day! For your guests there is a variety of accommodation around Hathersage to suit all pockets, including the 16th century coaching inn the George Hotel in Hathersage village. Guests can also enjoy the many attractions of the area including the Peak District National Park and its many and varied walks.